Whenever gold seems to do well, there’s a rush to buy, hoping that it will continue to rise. Fears about the stability of the U.S. dollar also tend to push gold prices up. However, before you decide that you need to buy gold immediately, it’s a good idea to take a step back. Gold is an asset like any other—it can rise or fall due to sentiment. Why Do People Like Gold so Much? First of all, it helps to understand why some investors like gold so much. In many cases, it has to do with the idea that gold is, well, gold. It’s been valuable for thousands of years. Unlike so much of our money today, which we access via card or by making information transfers, it’s possible to touch gold. Even though gold has a long history as money, that doesn’t mean it’s the best choice for your portfolio. That said, there are some good (and some terrible) reasons to include gold in your portfolio. One of the biggest reasons to include gold in your portfolio is to hedge against inflation. As a value storage vehicle, gold has managed to do pretty well over time. Inflation can erode the spending power of a dollar, but gold can help you hedge against that loss of value. Gold prices often move opposite to the dollar, so if the greenback weakens, gold is likely to strengthen. However, even when gold isn’t heading higher at a rapid rate, it is still considered a pretty decent way to keep from losing out to inflation. If you don’t think bonds and stocks provide enough diversity, adding a little gold can help you feel a little more comfortable. Gold often moves opposite to the stock market. So, if the stock market drops, gold often heads higher. 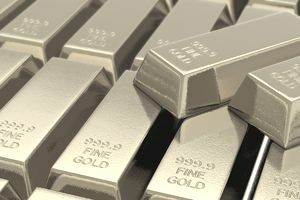 If you want to add some balance to your portfolio, gold can be one way to do it by diversifying your assets in a way that can partially protect you from a market event. How Much Gold Should Be in Your Portfolio? Your portfolio should be structured in a way that helps you reach your long-term goals. Gold might have a place. However, many experts warn that you should be wary of how much gold to include in your portfolio. One rule of thumb is to limit gold to no more than 5 to 10 percent of your portfolio. Depending on your situation and your risk tolerance, you might be more comfortable with a bigger or smaller share of gold in your portfolio. Some investors believe that gold isn’t just a hedge against inflation or a useful part of a diversified portfolio. They believe that there are intrinsic uses for gold. Unfortunately, if you are stockpiling bullion against economic collapse, you might be in for a rude awakening. In such a scenario, will your neighbors be able to use gold? Instead, during the economic apocalypse, you might be better off with a cache of food and water—and the ability to hunt, fish, or grow a garden. On top of that, some believe that if the United States moves to a gold standard they will benefit from their gold stores. The chance that we will see a gold standard in the near future is pretty slim. There is so much money in circulation (paper and digital) that switching to a gold standard is impractical and highly unlikely. Our financial system would likely need to collapse completely to make such a switch feasible. In the end, gold can make a fine addition to your portfolio—as long as you know why you’re including it and it helps you reach your long-term financial objectives.